The Federal Trade Commission announced today it has settled a lawsuit against drug company Cephalon, now owned by Teva Pharmaceutical Industries, Ltd., for $1.2 billion – the largest settlement of its kind to date. “Today’s landmark settlement is an important step in the FTC’s ongoing effort to protect consumers from anticompetitive pay for delay settlements, which burden patients, American businesses, and taxpayers with billions of dollars in higher prescription drug costs,” said FTC Chairwoman Edith Ramirez. According to the FTC, the settlement money will go toward refunding purchasers like insurers and pharmacies who paid too much for the drug. 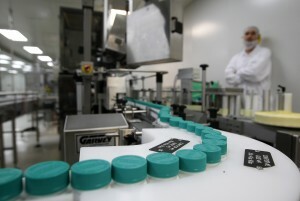 As part of the settlement, Teva has also agreed not to enter into similar deals in the future. Drug manufacturers defend the deals, saying they help resolve costly patent litigation and even bring generic drugs to market before the brand-name patents expire. Last year, PBS NewsHour profiled multiple sclerosis patient Karen Winkler, who has taken Provigil for years to combat extreme fatigue. After Provigil went generic in 2012, Winkler said her out-of-pocket cost for the drug fell from around $700 to $16 for a three-month supply.